A 38-year-old man presented to the United Christian Hospital, Hong Kong, with acute epigastric pain in October 2014. He was a chronic drinker and had experienced intermittent abdominal pain for 6 months. His serum amylase level was elevated (454 IU/L), and a diagnosis of acute-on-chronic pancreatitis was made. The patient was treated conservatively. 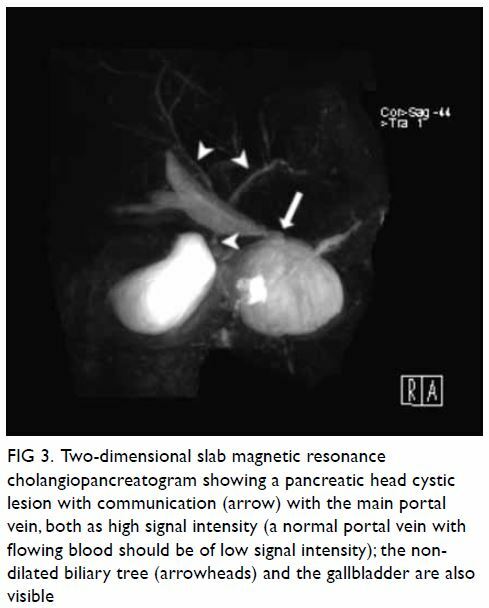 Magnetic resonance cholangiopancreatography performed 3 months after hospital discharge showed a 5.8-cm-diameter unilocular cystic mass over the pancreatic head (Fig 1). The main and right portal veins showed a signal intensity identical to that of the cystic pancreatic lesion on all phases, without any contrast enhancement (Fig 2). There was communication between the main portal vein and the cystic mass (Fig 3). The presence of multiple collateral veins in the hepatic hilum was consistent with cavernous transformation (Fig 2c). Features were suggestive of a pancreatic head pseudocyst that had ruptured into the main portal vein. The patient presented again 1 month later with recurrent pancreatitis. Contrast computed tomography (CT) showed that the pancreatic pseudocyst had enlarged, to 7.6 cm in diameter (Fig 4). Pancreatic cystojejunostomy and cholecystectomy were performed. Intra-operatively, a 10-cm cystic lesion at the pancreatic head was found, and 200 mL of clear fluid was aspirated. Intra-operative ultrasonography showed the lack of flow in the main portal vein. The patient had a few more episodes of recurrent pancreatitis thereafter. The last CT examination, performed 2 years after surgery, showed a reduction in the size of the pseudocyst, to 2 cm. The patient remains on regular follow-up. 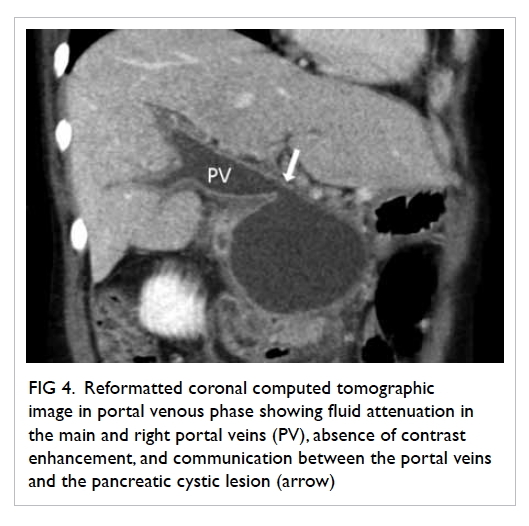 In summary, rupture of a pancreatic pseudocyst into the portal vein is an uncommon complication. 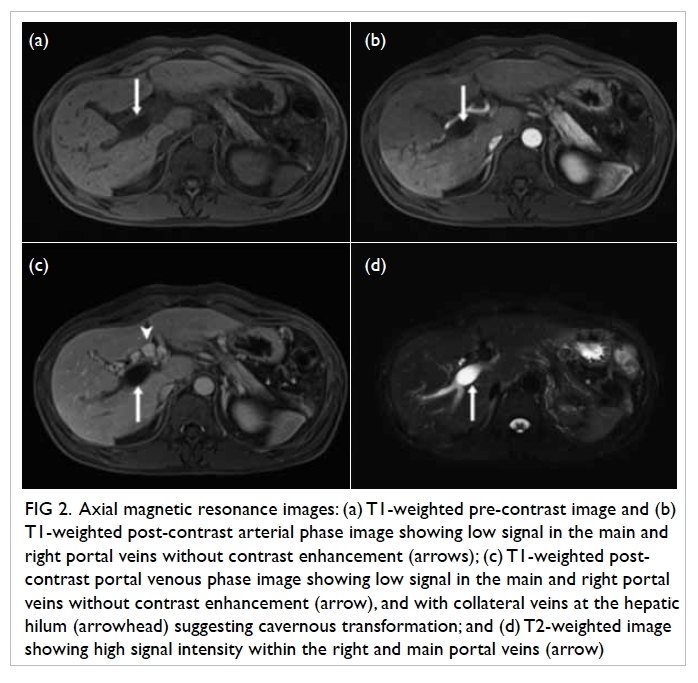 On MRI, demonstration of fluid signal in the portal vein that matches the signal intensity of a pancreatic pseudocyst allows the diagnosis to be confidently made, obviating the need for more invasive investigations. 1. Dayal M, Sharma R, Madhusudhan KS, et al. 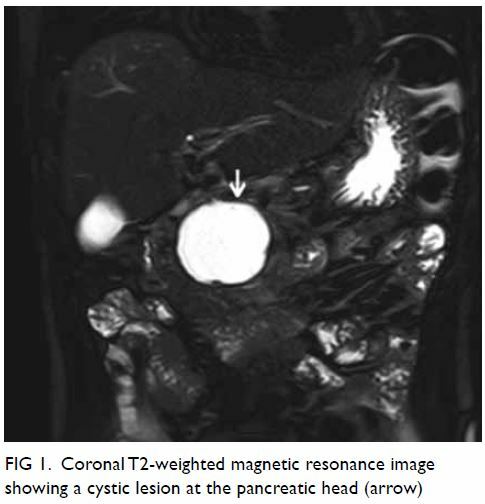 MRI diagnosis of rupture of pancreatic pseudocyst into portal vein: case report and review of literature. Ann Gastroenterol 2014;27:173-6.